Viewing various alternate realities from his lab in the Baxter Building, Reed Richards witnesses the multiple deaths of Susan Storm. Outside the building, the Avengers are attempting to fight their way through the building's defenses in order to confront Reed. They want to learn why the Black Widow had been held captive for months while a future version of Natasha took her place. Inside Reed's lab, the leader of the Fantastic Four and the Sub-Mariner discuss the reason for their deception of the Avengers. Reed explains that two years from now, events would have caused her death unless he changed the circumstances. In order to achieve his goal, Mr. Fantastic suggested to his girlfriend that she join the Avengers. The Invisible Woman's membership alter the future events enough to save her life. However, Reed felt she must stay with the team even longer to guarantee her safety. As a result, he brought a future version of the Black Widow to the present due to her being more experienced in psychological manipulation. However, the arrival of the future Natasha required the present version to be kidnapped by Namor and held in Atlantis. Suddenly, the Black Widow appears behind them. For a moment, they believe she is the one who was kidnapped but soon learn she is the future version. Natasha wonders why she doesn't remember the kidnapping from when she was younger. Reed explains that the changes in the timelines will become permanent once Sue is safe but no one will remember the events. Future Widow hopes that time will be soon because she knows the Avengers are on their way. She reveals that she was in the mansion when the present Natasha returned. Nova showed them the files Reed Richards had created for the imposter in order for her to fit in with the team. Thor confirms it with Odin's message about a fake Avenger. 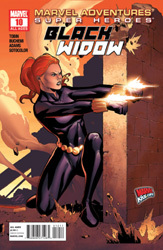 The current Widow reveals it was Reed Richards who was behind the scheme. The Avengers decide to storm the Fantastic Four's headquarters to find out the truth. Five minutes later, Nova and the team are fighting against the building's defenses. Sue instructs Rich to hit a small spot in the building with his full power. Despite Nova's great powers, the Invisible Woman realizes the best they can hope for is a small hole in the wall they can get through. As he blasts away, a small weapon appears from the wall and blasts Nova! Iron Man catches his teammate and takes him to safety. Inside the FF headquarters, Reed continues his explanation. He reveals that Sue was becoming so attached to the Fantastic Four that she was was falling apart from sheer exhaustion. This inevitably leads to the mistake which would kill her unless he intervened. Dr. Richards felt the Avengers were the best team for Susan to become involved with. Fortunately, Sue was already interested in joining the team and Reed quickly encouraged her actions. Outside, the Invisible Woman is frustrated by their lack of success. She orders Thor to unleash his hammer's power. The wall quickly collapses from the impact. Sue quickly instructs Captain America to block the incoming lasers while Iron Man destroys them with a repulsor blast. The Invisible Woman continues her attack plan with Thor taking out Reed's robots. At the same time, she tells Nova to fly quickly to the end of the hallway with Natasha so she can enter in the disable code. Within the Baxter Building, the leader of the Fantastic Four tells Namor that the defenses are on their lowest settings. He doesn't want to harm anyone, just delay them long enough to save Sue. The Sub-Mariner asks Reed if his time machine could prevent the fall of Atlantis and other catastrophies in history. Dr. Richards believes it is possible however it would be extremely likely that preventing one tragedy would cause a hundred more to take its place. Only his love for Sue Storm allowed him to interfere with time more than once. As the Avengers head towards Reed's lab, the security doors close and trap them inside. Susan quickly generates an invisible shield to protect them from a containment fluid that is spreading towards them. She instructs Iron Man to blast a hole through the floor which takes them to the Robotic Development Lab. Inside another part of the building, Reed knows the robots won't stop the Avengers for long. He is simply stalling them until the spheres of time realign and make Sue's survival permanent. Meanwhile, future Natasha sneaks out of the room and meets up with her present day counterpart. She reveals to her younger self that she is there to save Sue's life and to also warn her to be careful with Nova because he will grow up. Before she can explain her warning, time resets itself and the future Black Widow disappears. Elsewhere, the Avengers confront the Sub-Mariner and Mr. Fantastic. Before any explanations can be given, everyone disappears due to the time shift with all their memories of the events gone. Reed is left standing alone thinking about his love for Sue.